They say the traditional publishing model is dead. The buzz on the street is self-publishing, or even better “e-publishing.” Well after wasting several hours trying to self-publish and e-publish a short story with illustrations, I’m not so sure about the demise of New York publishing houses. I wrote a simple, feel-good short story that takes you back to the first Easter morning via the viewpoint of the stone in front of the tomb. It may not be a classic masterpiece, but the message is very meaningful to me, and I wanted publishing it myself, or maybe just get it out there into the digital world for people to enjoy. I hired an illustrator. She produced some simple pencil drawings that captured the essence of the story quite well. I bought them, scanned them, and inserted them into the story at just the right spots using Microsoft Word. I printed the story. It looked just like it did on my computer screen. My editorial staff (my kids) reviewed it and gave me the thumbs up. Next, I went to a well-known self-publishing site and opened an account. According to their advertising, they offered turnkey solutions for printing the book. With a click of the mouse, I was on my way. (Take that you New York fat cats!) As instructed, I converted the word document into PDF, and uploaded it. I picked a standard size for my best seller, and fumbled through their cover design process, which was too elaborate for my small project. Finally, I got to the last step and the website began to convert my words and purchased sketches into a book! (It was like Christmas morning!) Wait… a message popped up. My book was too short and they couldn’t publish it. I mumbled a few less-than-Christian things at my computer screen. My wife overheard my ranting and had pity on me. She sent me a link for self-publishing that she heard was one of the best. I cooled my jets, resolved not let this setback be the end of a worthwhile story, and clicked on the link. This site was better. It had better testimonials. I opened an account. They had a wizard button! (I spit in your face cruel traditional publishing model!) At step two I was trying to upload the cover and found myself restricted to a variety of vanilla options, but for a small fee they could help make my cover eye-catching and professional. Of course, I remembered the old adage, “You can’t judge a book by its cover,” and accepted one of the vanilla options. When I got to the end, I found myself in a quagmire of legalese about distribution, royalties, and ISBN numbers. It gave me a headache, and I went back to my ranting. The next day, I remembered an email I had previously received about e-publishing. I combed through my various spam folders and found it. It offered a simple way to get your books out into the digital library using adjectives like “free,” and “easy.” Still longing to get my inspiring treatise in the hands of longing readers, I decided to give it one more try. The account setup lived up to the advertising. I was ready in a snap. Then I uploaded the book and the website converted it. “Finally,” I thought, “I have found the holy grail of e-publishing and my story will cruise along the information superhighway to wonderful digital destinations all over the worldwide web.” The website informed that the conversion of my story was complete, and I clicked on the preview button. Several hours and multiple attempts later, my wife found me screaming at the computer again. “What’s wrong dear?” she asked. She sensed my frustration (and having read the majority of everything I have written – she knew my writing needed my time… a lot of it), and offered a solution. My wife is now my agent, publisher, and promoter in the self-publishing world. That should free my creative mind… but it will make the rejection letters a bit more interesting. I let the story sit for a few weeks. Then one afternoon at Scout Camp with my son, I was free for a couple of hours. I sat down among the pines of the Arizona high country, opened my laptop, and typed up the story. It flowed from my fingertips just as easily as it had come to me that sleepless night. I was excited. I tinkered with the story from time to time. I trimmed it down. I changed wording. I tried to find the essence of the story and tell it in the most straightforward fashion possible. I let a few people read it. They enjoyed it, and I was encouraged. Later that summer, I attended a seminar hosted by Orson Scott Card. I mentioned the story to him and asked for advice. He recommended a title change, and suggested that I find an illustrator. I began to think it might get published. I started looking for a home for the story, but I really didn’t know where to start. I sent the story off to a traditional publisher and described my vision for its publication. A couple of months later, I got my first rejection letter. The story sat, but I didn’t forget it. As Easter of 2010 approached, I pulled it out and dusted it off. I reworked the opening and polished the prose. I gave it to a few friends to read for Easter, and everyone praised the story. But I still didn’t know what to do with it. The story sat waiting for me to do something. 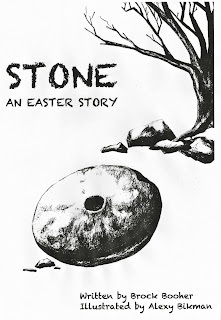 Another year went by and as Easter of 2011 approached, the story and its message haunted me. I pulled it out again and gave it another edit. I tweaked a few words and sentences, but realizing that story wasn’t commercially viable, I still wondered how to get the story out for others to enjoy. Then, a friend sent me an article about self-publishing, and I wondered if I should try that with this story. After all, this story meant something to me, and I felt compelled to make it available. Following the advice of Orson Scott Card, I emailed my friend Alexy Bikman who occasionally works as an illustrator. I gave her a copy of the story and asked her if she could produce some simple drawings to help bring it to life. She quoted her price, and started her work. A couple of weeks later she delivered a few simple drawings that I thought captured the vision of the story. I took those drawings and combined them with the words to make a nice illustrated short story. I decided to publish the story digitally first, and then work on the hard copy format second. It took me several maddening attempts to get the formatting right, but I finally published the story using Kindle Direct Publishing. You can find the story on Amazon for ninety-nine cents. If you don’t have the Kindle, you can download the Kindle reader software for free. Then set up an account to purchase books, and download the book to your computer, Kindle, Nook, smart phone, or any other electronic reading device. Graves are often marked with headstones, because the dead, like stones, are cold and lifeless. They lie in the stony earth and return to dust, but I can tell you that the dead will remain neither dust nor stone forever. If you enjoy the story, write a review for Amazon and tell your friends. If you think a hard copy would be nice, post a comment here or email me. I hope you enjoy this Easter story.